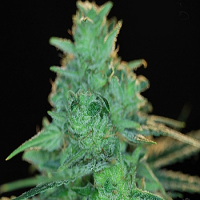 Kubanskiy Ubiyza Feminized Marijuana Seeds by Kalashnikov Seeds: Despite its grim and creepy name (it means “Killer from Kuban region”), Kubanskiy Ubiyza is a very positive strain, result of crossing Northern Lights, AK-47 and quite interesting a Sativa-dominant hybrid from the sunny Kuban region on the south of Russia. Absolutely undemanding, resistant to high humidity levels as well as dry and hot summer weather. Plants are pretty tall, reaching up to 2 to 3 meters outdoors and highly productive in any climate. 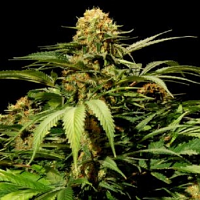 Big elongated buds densely covered with thick layers of resin with high levels of THC. 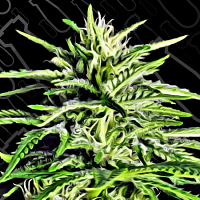 “Killers” grow fast for Sativa-dominant plants, only 55 days resulting in 600 grams per sq.m indoors. Ideal for B.H.O.(WAX). 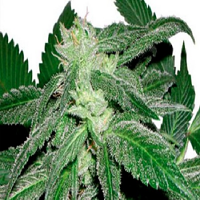 Effects while smoking dry product are totally hammering, as proposed by its name, very physical and relaxing. Taste is lemony, sour with hints of tropical fruits.